Phileas Fogg, an eccentric English gentleman and bachelor, lives in London. He is one of the most upstanding members of the Reform Club. his fellow club members and goes back home at midnight. 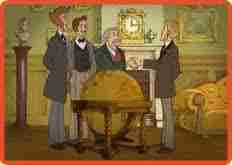 Phileas Fogg has just hired a new servant, a French man called Passepartout. Passepartout feels happy to work for the calm Mr. Fogg. morning until midnight everything is planned. Just what I need, he thinks, a homeloving and organized man. has robbed the Bank of England. Detectives have been sent to the main ports of Liverpool, Glasgow, Suez etc. In the evening, as Fogg is playing cards with his usual partners, he gets involved in an argument over this theft. He finally bets them £20,000 that it is possible to round the world in eighty days. 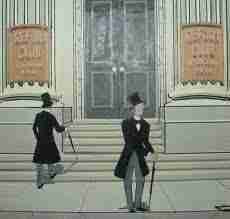 Fogg leaves the Reform Club immediately, prepares a bag and puts £20,000 in Passepartout's bag. At 8.45 pm they take at Charing Cross Station a train for France. Seven days later they are in Suez. In Suez the detective Fix is looking for the gentleman thief. 'Where are you going?' he asks. 'Around the world' says Passepartout. But right now I need some new shirts! The gentleman thief is going to Bombay. Stop. Fix. Later he gets on the ship to Bombay with Fogg and Passepartout. They had arrived in Bombay two days earlier. At 4.30 in the afternoon Fogg and Passepartout leave the ship. They want to get a train across India to Calcutta. It leaves at 8 o'clock. First Fogg goes to the passport office. Then he eats at the station. Passepartout visits the temple at Malebar Hill.......but he doesn't take off his shoes. The priests get angry. They take his shoes and Passepartout runs away. Fogg and Passepartout get on the train but Fix stays in Bombay. He is waiting for a telegram from London. After three days the train stops. The railway from Kholby to Allahabad isn't ready. to Allahabad. They stop near a temple in the village of Pillaji. The old Indian prince is dead. His young wife -the princess- must die with him in a big fire. << font=''> 'We must help that woman!' says Fogg. The priests start the fire. Through the smoke Fogg sees something beautiful. 'Quickly! let's go' says Passepartout to Fogg, quietly. prince's clothes is not the prince and they become angry. Fogg, Passepartout and the princess leave very quickly on the elephant. 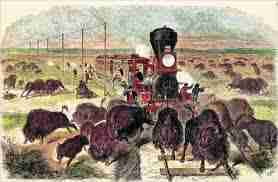 The rest of the trip is delayed by storms at sea, an Indian attack in the American West. and causes them lots of trouble. Nevertheless Fogg manages to win his wager. Eighty days later, at 8.44 and fifty-seven seconds he opens the door of the club. But what Fogg has really gained during this expedition is Aouda's love. This adorable young woman makes him the happiest of men. Write the text below in the simple past tense. 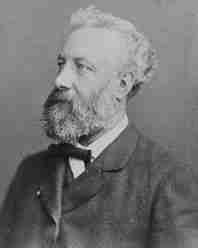 Phileas Fogg, an eccentric English gentleman and bachelor, (lives) in London. He (is) one of the most upstanding members of the Reform Club. and (goes) back home at midnight. 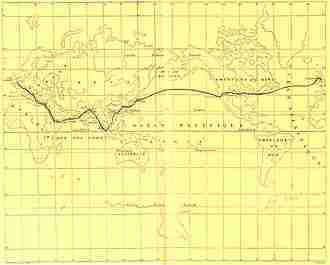 Phileas Fogg had just hired a new servant, a French man called Passepartout. Passepartout (feels) happy to work for the calm Mr. Fogg. the schedule of his daily duties. From 8 in the morning until midnight everything was planned. Just what I (need) , he (thinks) , a homeloving and organized man. Fill in the blank with the number of the correct response 1, 2 or 3. What is the name of Fogg's Club? Why does Fogg go around the world? What does Fix use to communicate with Scotland Yard? What's the name of the princess Fogg saves from death? Why does Passepartout have to buy a new pair of shoes?